5 Hour Energy Pink Lemonade Energy Shot - 1.93 oz. 5 hour Energy Grape - 1.93 fl.oz. 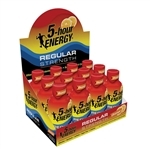 5 hour Energy Extra Strength Grape - 1.93 fl.oz. Extra Strength Sour Apple Energy Drink - 1.93 Fl. Oz. 5-hour ENERGY Strawberry-Watermelon Extra Strength - 1.93 Oz. Peach Mango Extra Strength - 1.93 Fl. Oz. 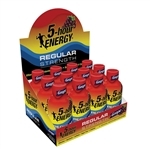 5-Hour Energy Extra Strength Grape - 7.72 Oz. 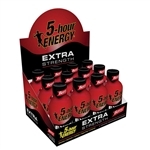 5-Hour Energy Extra Strength Berry - 7.72 Oz. 5-Hour Energy Berry - 7.72 Fl. Oz. 5-Hour Energy Blue Raspberry Extra Strength - 1.93 Fl. Oz. Peach Mango Extra Strength - 11.58 Oz. 5-hour Raspberry Tea - 11.58 fl. Oz. 5-hour Lemonade Tea - 11.58 fl. Oz. 5-hour Raspberry Tea - 1.93 fl. Oz.